Not long ago I was trying to help a friend locating a CD copy of this Canadian Metal gem. Tough time, since the original issue (1986, Aquarius Records) still goes up for 50.00 USD or more. The vinyl copy is of average price but - I bet - whoever's into 'classic' 80s Metal already owns this monumental album. SWORD and Metalized once showed what kind of magic does honest Metal music provide in its peak. This re-release from Krescendo Records is a good opportunity for younger metalheads to possess a neat diamond of Metal from Canada. 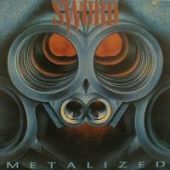 SWORD released only two LPs in 1986 and 1988, with the Sweet Dreams follow-up being one step below Metalized's value just because it was not first in the making. SWORD portrayed a wonderful blend of American Metal with cruel guitars, attack-ful solos, pounding bass/drums and metallic yet melodic vocals. Resembling to the pre-Gutter Ballet era of SAVATAGE or BARREN CROSS, similar to the volume of METAL CHURCH or mid-80s METALLICA, baptized in the sacred well of Dio's and Ozzy Osbourne's first couple of albums and JUDAS PRIEST's overall offerings, Metalized is Heavy, Speed, Power and - overall - Metal with nothing less than a dignity rarely seen in bands even of that golden era. Rick Hughes' throat will hunt you, no questions asked. He screams, he yells, he declares, he's passionate, he's warm, he's majestic, all in one. His harsh voice (a mix of Ronnie James Dio, David Coverdale, Jon Oliva and - to an extent - Johhny Gioeli) he was SWORD's trademark and he definitely deserved something better in terms of recognition (a fine album with SAINTS & SINNERS - in a more hardrockin' style - followed in 1992, while Rick was lately working on his own ZODIAX project). The rest of the band, of course, offered in building up a metallic volume of powerful Heavy Metal music you must bow to. The band's club hit was F.T.W. (Follow The Wheel - check the video below and beg for mercy…) while a clip was shot for Stoned Again, too. 23 years have passed since the original release date and - among the endless rave reviews worldwide - it's of interest Dave Mustaine has something to say 'bout Stoned Again (http://www.youtube.com/watch?v=h75MSG0zASU). SWORD opened for METALLICA on their Master Of Puppets tour while supporting also ALICE COOPER and MOTORHEAD. Need more? As written in a Metal forum the other day: So 80's Metal, it hurts…Real class: SWORD.